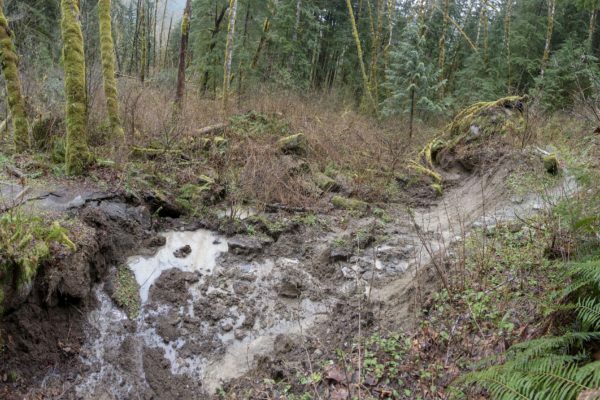 Last weekend in the Middle Fork Snoqualmie Valley, reports began to flood in of something gone awry on the popular Middle Fork Trail. Hikers described trees crashing down—on a calm day. Creeks ran high, flush with their banks. And most ominous of all, cracks were forming in the trail, some at least three feet deep and nearly as wide. A series of trip reports documented worsening conditions throughout the weekend. But the full scope of the damage wouldn’t become clear until Thursday morning, April 12, when longtime Middle Fork volunteer Monty Vanderbilt arrived onsite to do a scouting report on the cracks. Instead, he found a complex landslide that had wiped out more than 200 feet of the Middle Fork Trail. Mt. 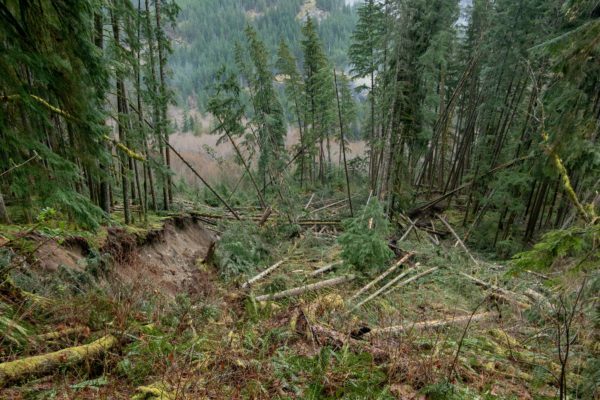 Baker Snoqualmie National Forest had declared the trail impassable due to the active slide. Hikers, bikers, and equestrians should steer clear—the area is not suitable for travel. Volunteers and U.S. Forest Service staff scouting the area on Friday reported continued creeping and cracking of the soil surface, audible popping and snapping of trees, and lots of surface water; all signs indicate that the area is still very active. With sustained heavy rain expected this week, the active slide danger continues to be severe. According to the notice issued by the Mt. Baker Snoqualmie Ranger District, the trail is closed through December 31, 2018 for assessment and repairs. As many people asked on the initial reports: Why here? And why now? April 12: VanderBilt estimated the slide was 200 ft. by 500 ft. In tandem with the atmospheric river (a.k.a. “Pineapple Express”) that brought heavy rains to Western Washington last weekend, the slide was made possible by a phenomenon operating on a very different time scale. After all, nearly 17,000 years ago, the Middle Fork Valley was underwater—at the bottom of Glacial Lake Snoqualmie. The Puget Lobe of the Cordilleran Ice Sheet moved up the Western slope of the Cascades (along what’s now I-90) all the way to North Bend. Today, Grouse Ridge, a prominent moraine running from Mount Si across the mouth of the Middle Fork Valley to Mailbox Peak, marks the eastern extent of the Canadian ice. As meltwater drained from the glacier from North Bend into the Middle Fork, it was met by meltwater flowing the other direction, draining from the present-day headwaters of the Middle Fork Snoqualmie River. With so much water confined in the valley, it began to pond, eventually filling the valley to form a new lake. Unlike it’s well-known siblings—Glacial Lake Washington and Glacial Lake Sammamish—Glacial Lake Snoqualmie left no modern-day body of water behind. But geologists know of its presence because as the bedrock was carved by ice to form steep peaks and valleys, glaciers also left behind clues in the form of sedimentary deposits—like Grouse Ridge—that tell us about past conditions. Key evidence points to a large ice-dammed lake like Glacial Lake Snoqualmie filling the Middle Fork: Dirt! The clay-rich deposits lining the Middle Fork Valley could only have come from the bottom of a lake. Though the sediments were deposited tens of thousands of years ago, they can cause big problems today. Clay has a special ability to absorb water, so when we receive lots of rain in a short time period, it gets heavy—and fast. It’s a common factor in many landslides, slumps, and liquefaction events. The slide on the Middle Fork Trail is still moving today. But once the area stabilizes, we’ll be working with Mt. 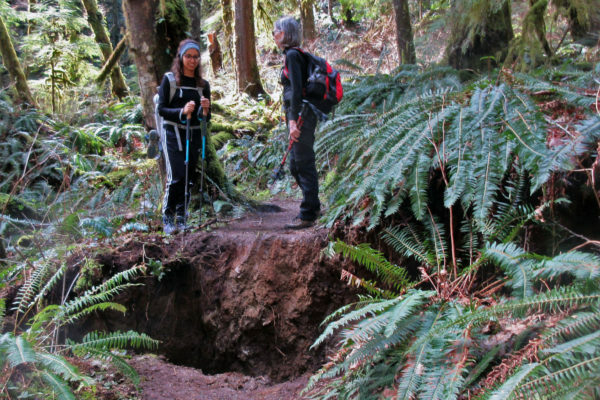 Baker Snoqualmie National Forest and partners to repair the trail. In the meantime, fans of the Middle Fork Valley can enjoy alternate routes like the CCC Trail, Pratt River Trail, or Granite Lakes Trail.